One year ago I posted my goal for 2016: to become an Accredited Genealogist. Luckily I gave myself a caveat that if I didn’t get it done in 2016, there was always 2017. Well, it’s officially 2017, and I do need the extra time to meet this goal. What did I learn last year? Where am I in the process? Why would you want to explore accreditation? Good questions that I’ll try to answer. January of 2016 I had been waffling about whether to really go for accreditation or not. When I took the plunge and wrote a blog post stating my goal, it motivated me to seriously put in the work. I signed up for the study groups sponsored by ICAPGen (International Commission for the Accreditation of Professional Genealogists) and proceeded to start working on my four-generation project. The level 1 study group went through the spring months and focused on objectives, report writing, citations, analysis, conclusions, and future research. Basically it was a crash course on writing a research report for a client. I soaked up the information and really enjoyed the process of analyzing and proving my research findings. At the beginning of summer I went to work on the second generation and made a plan to finish all four generations and submit my application by the July 1st deadline. But life happens and summer vacations, family reunions, welcoming a new grandbaby into the family and my garden took time, so I decided to shoot for the October 1st deadline instead. I worked diligently through the summer, but by the middle of September I was still in the middle of writing my third generation. Full of indirect evidence, it was proving to be more difficult to organize than the previous generations. I simply needed more time. January 7th looked doable, so with my new deadline in mind I pushed ahead. I determined that I would submit this time, and I did! On January 6th, I turned in a forty page report (the maximum allowed), forty supporting documents, four research logs (one for each generation), a pedigree chart showing just the four generations, and six family group sheets (one for each generation plus a couple of previous marriages in the fourth generation). Over one hundred pages of blood, sweat, and tears. No wonder it took a year to put together! 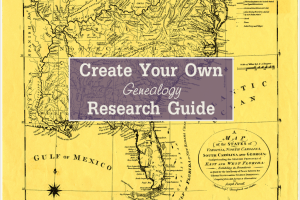 The four-generation project is graded by two separate Accredited Genealogists based on a detailed rubric. I will need a score of 90% to pass. I’m hoping for the best and studying for the Level 2 exams scheduled for February 18th. If I pass Level 2, I’ll take the Level 3 exams in May. If I pass those, I’ll do an Oral Review with two Accredited Genealogists, then I’ll have reached my goal! I haven’t turned in a project to be graded or taken an exam more complicated that a driving test in over thirty years, so why am I subjecting myself to the stress of accreditation? I love learning and I love researching my family. I also feel the need to start a new career and accreditation just feels right. Throughout 2016, blogging and working on accreditation was a perfect fit. As I discovered new sources, I wrote about them, which helped me better understand the records and what the information proved. I also wrote about new skills that I learned along the way. Looking back on 2016 here are some of the skills I acquired. How to write a report using analysis. 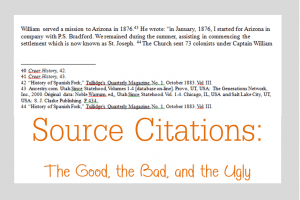 How to make an image of a source with the citation included. How to put together a client research report with an objective, summary, and conclusion. How to create a research log that really functions. The 40+ page widow’s pension file of my great great grandmother dating from 1929-1942. Three original land case files dated 1841, 1907, and 1915. A 23-page equity suit from 1812. Civil war service records for two great great uncles showing the dates and places of death. The 40+ probate case file of my 3rd great grandfather. Why would you want to pursue Accreditation? Granted, it can seem overwhelming. But I am proof that slow and steady wins the race. I actually had no idea what was ahead of me when I started, but looking back, I’m grateful for the process. If you love to research and would like to hone your skills, accreditation will stretch you, teach you, and make you a better genealogist and family historian. 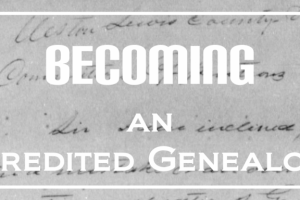 If you’re interested, take a look at the Guide to Applying for an Accredited Genealogist® Credential on the ICAPGen website. The downloadable PDF gives you all the information you need to get started. Interested in learning more about my journey? Select “Accreditation” in the drop down menu under “Research Tips” to access articles about my experiences, plus tips to help along the way. Best of luck in all your family history endeavors! Congrats on submitting you project, Diana! Thanks, Melissa. I just got word that I passed, so now I’m on to the testing! Congratulations on submitting your project! Good Luck! I am curious–what made you choose the iCAPGEN AG over the Board of Certification of Genealogists’ CG? My journey really has been serendipitous. When Nicole first suggested I look into obtaining a credential, she actually referenced the CG. I thought about it, then noticed that the BYU Conference on Family History and Genealogy had a track of classes by ICAPGen focusing on Accreditation. I decided to take those classes and find out what was involved. I liked being able to focus on a region and I had a family to use for the four-generation project. Everything just seemed to fit. I made several friends in the classes who were also pursuing Accreditation and one in particular lives close to me so we decided to work together in preparing. The study groups were invaluable in helping me move forward. I also become acquainted with several AG’s and their encouragement and support has helped me keep going. I’m just starting the ProGen Study Group and several members of that group are pursuing the CG. I’ll be interested to compare their experiences with mine in Accreditation. In the future I might pursue that as well! Thanks, Nancy. It definitely is a wonderful feeling to have it done! Now on to the testing.